The try-fail cycle is common in many different types of narratives. Characters do their best, have some successes, but ultimately fail for any given reason. 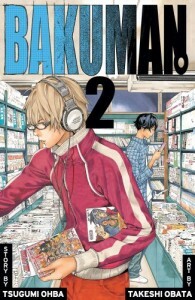 Bakuman typifies that sort of narrative. Mashiro and Takagi face failure and success with both manga and romance. While volume 1 focused on the leading pair, volume 2 introduces what will eventually start to carry this manga. A supporting cast. A good lead is important, but it’s the supporting cast that provide the texture to any narrative. While some main characters could do just as well on their own, they are only boosted by a good supporting cast. In volume 2 the main two new additions to the cast are Hattori, Mashiro and Takagi’s editor, and Nizuma Eiji, the possible antagonist, who has demanded the right to end any series he hates if he becomes the most popular author in Jump. Hattori is the typical advisor type character, both in function in the story, and by job description. He recognizes the pair’s talent, and takes the necessary steps to help their talent grow. He’s basically portrayed as the ideal editor, which could be seen as things being easy for the two main characters. They have a studio just given to them, and now they have the perfect editor. While things don’t go this well in real life ever, it can be forgiven in Bakuman because it isn’t trying to portray the manga industry realistically. Nizuma doesn’t have that many appearances in the volume, instead he spends most of his time in the background, preparing to make his appearance in the main story. Whatever his intentions, he’s a strange, strange little man, whose lack of interpersonal skills can either be endearing, or threatening, depending on which direction Ohba takes him. 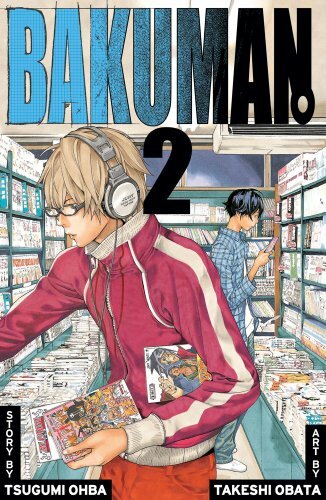 The reason Bakuman is currently counted among my favorite shonen manga series is because it takes the typical adventure story, and turns it into something that the readers can realistically dream about. Of course anyone can dream about being Luffy, Naruto, or Ichigo, but the fantasy is never quite as fun because it’s obviously just that, a fantasy. With Mashiro and Takagi on the other hand, their goal is firmly based in the real world. Even if some liberties are taken, becoming a manga author is something a kid can dream of and actually think of it as being possible. The combination of fantasy and realism is what makes it such a compelling read. It also helps that discovering tidbits about the manga industry and seeing favorite manga series referenced is a great thrill. And as always, the ultimate goal for our protagonists is close enough to my own that I find myself relating all the more. And given how easily influenced I am by what I read, I think in the long run it’s much more valuable for me to be pumped to become the greatest writer ever, than to want to become the greatest martial artist in the world. Just saying.